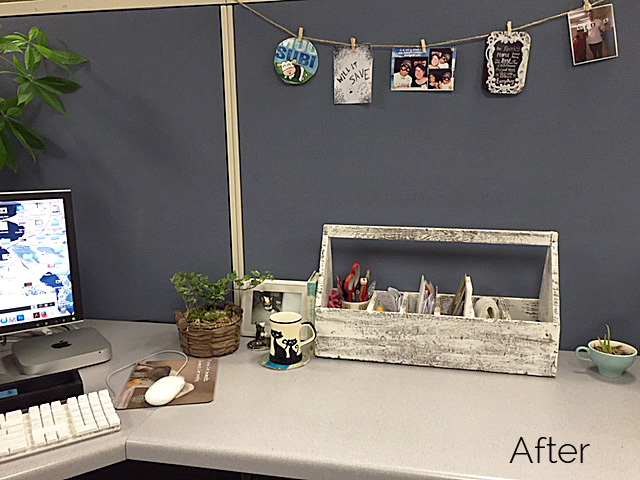 Never have a messy desk again | Bringing together stories, rooms, life. 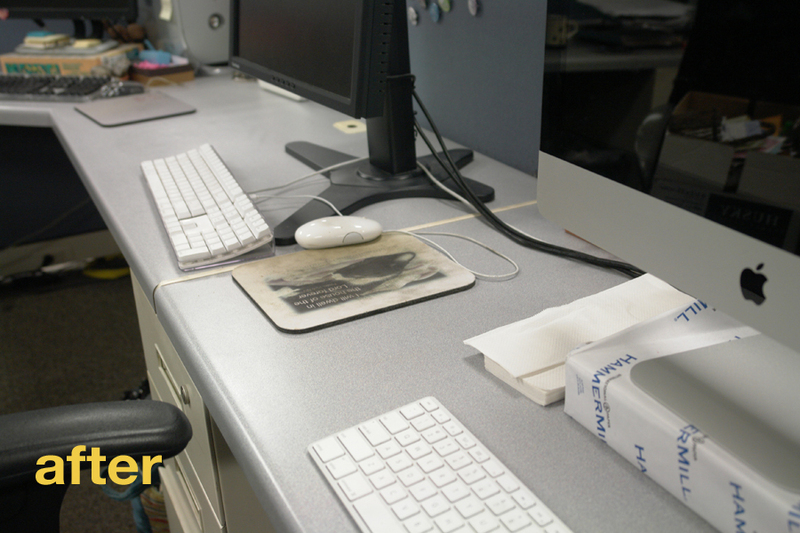 In February of 2014, I reorganized my desk and created a neat, organized work space. Unfortunately, it only lasted a week. One, I thought the job was complete. And two, I thought having a clean space was fine. Since then, I have read “The Life-Changing Magic of Tidying Up” by Marie Kondo and it changed my life. Click here to read original post about the book. The job is never complete. Being tidy is a process, not a task. It’s something you have to be mindful of with everything you do. It’s not enough to tidy the end of every day. You also need to tidy at the end of every thing you do. For example, when you’re done with the scissors, put it back. Two, it’s not enough to tidy your space (this applies to your home too). You have to transform it into a space that you love. Only then will you keep it neat and tidy. You’ll have room to breathe. Room to be creative and productive. You won’t waste time looking for a missing memo or pen. 1 Start by tidying and declutter your space. Discard everything you don’t need. I filled 2 trash bags in no time. Dust and wipe your area when done. 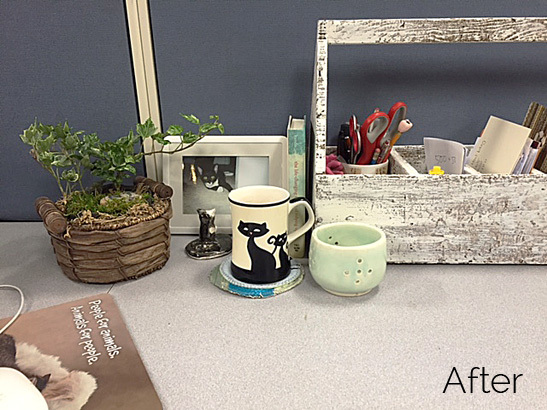 2 Adding plants to your space will make your desk look less dreary and more alive. Fresh flowers are nice too, but a plant will last longer and is a great mood booster. For a list of the best cubicle-friendly plants, click here. 3 I love succulents, but since succulents require full sun, I opted for a faux one instead. 4 This wooden toolbox is a great place to corral my pens, notepads, and loose paper. I found this homemade toolbox at a garage sale and dry-brushed it white to give it a fresh, milk-paint look. 5 I share my cubicle with two graphic designers so an inbox is vital for paperwork going back and forth. I love the aqua color of this stacked tray so I challenge myself to get to the bottom of all my paperwork so that the color is showing. 6 I painted a matching outbox that’s cheerful and fun. 7 Instead of using boring thumbtacks to pin all our projects, we hung clipboards using paperclips. It’s a nicer, more uniformed wall display. 8 To personalize our space, we hung photos and inspirational quotes using twine and mini clothespins. It’s easy to add or switch out artwork to match whenever we feel like it. Here’s what our office used to look like. I guess you can say we’re creatively messy. 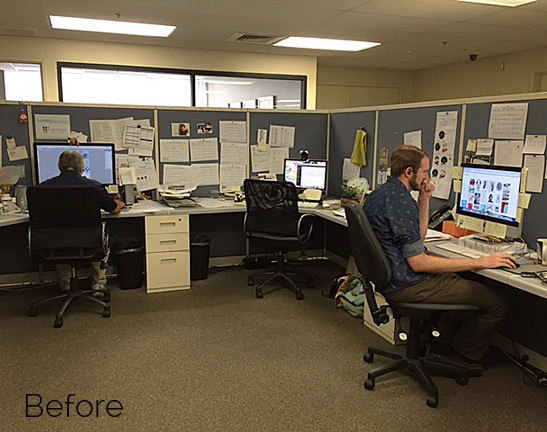 The empty chair is mine between graphic designers Karl (left) and Tyler (right). 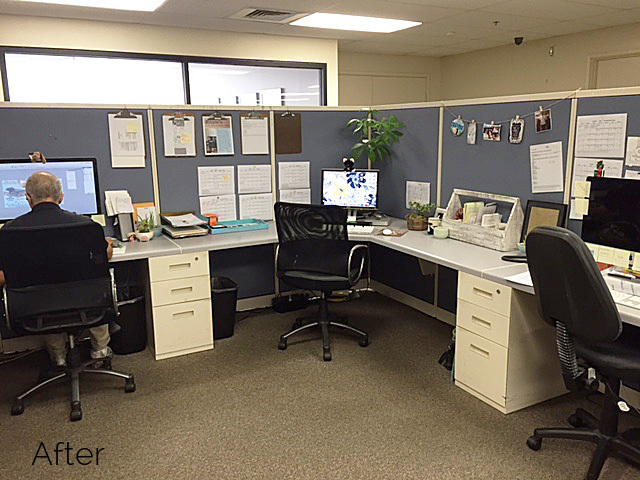 We are still creative, but in a more organized, beautiful space. 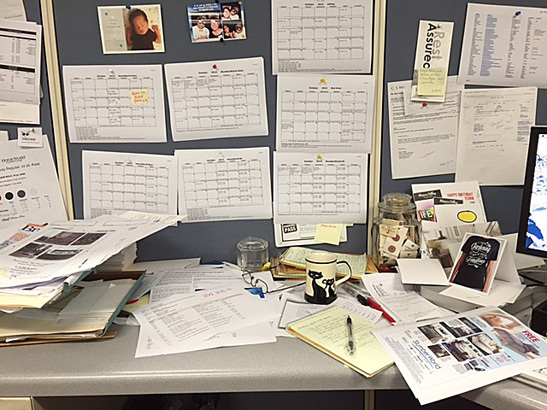 I hope you find inspiration to never have a messy desk again. 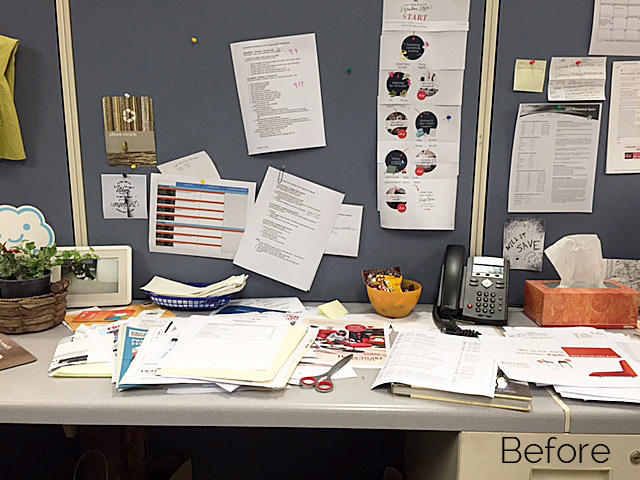 This entry was posted on October 28, 2015 by Terri Dux in Advice, Decluttering, Organization and tagged before and after, clean space, clipboards, cubicle makeover, desk, Life-changing Magic of Tidying Up, office, organization, organizing, plants, tidying.